Fun Size Episode 10 – Jodorowsky’s Still Alive | Radio vs. the Martians! This entry was posted in New Episode and tagged adaptation, alejandro jodorowsky, all along the watchtower, batman, battlestar galactica, breaking bad, captain kirk, dawn of the dead, dexter, dune, fun size, game of thrones, george r r martin, george romero, ghostbusters, heat death of the universe, hitman, james bond, jesse custer, jimi hendrix, john wick, just take the setting, kinsey burke, michael dorn, midnight special, patrick johnson, peter dinklage, planet of the apes, preacher, reboot, reboots, remake, richard hatch, sam mulvey, soylent green, star trek, stephen king, tank girl, that way lies madness, the mist, the warriors, transmetropolitan, video games, walking dead, witcher 3 by Mike Gillis. Bookmark the permalink. 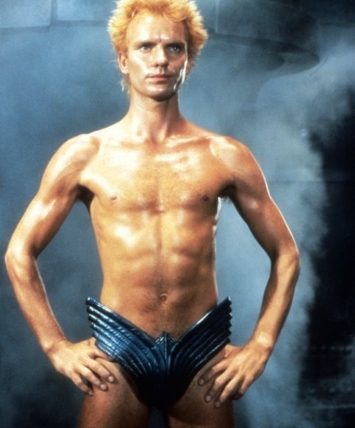 Apart from some of the hammy acting, I never got the flack that was hurled at Dune. I loved the film and saw it a couple of times in the theater. I had never read the books and was able to follow things fairly well, based solely on the info in the prologue and picking up pieces here and there. Funny thing was, the trailer had me picturing a much different movie, in my head. I thought the nose plug was some kind of parasite, since Paull is shown lying on the ground, eyes tightly shut, in a close-up, in the trailer. It looked like some kind of worn entering his naval cavity. I was thinking Wrath of Khan. I thought it was tied to the sandworms, as well as the spacing guild, since they also had tubes in their faces and the stage 3 navigator was a slug-like creature. The extended Alan Smithee cut actually kind of dulls the film for me. the prologue gives a lot more background, but you are well ready for the movie to get going before it ends. I also didn’t care for some of the alternate takes that were used, instead of the theatrical ones, like in the meeting between the emperor and the Guild representatives. The deleted scenes were fine, though things like reclaiming the water from the fremen that Paul kills wasn’t particularly vital to the story. The original film got me to read the book and the next two. I stopped after that, as I felt the story wasn’t as good with each book and didn’t see a point in reading the rest, especially since the consensus I encountered was that the later books werren’t very good. It’s also why I skipped the prequel novels, though a disdain for Kevin Anderson’s work on Star Wars helped fuel that. His writing there was pretty underwhelming and I didn’t think a more complex world was going to improve that. Plus, it wasn’t Frank Herbert. I would have preferred they skip that and just reprinted the Dune Encyclopedia. That gave you anything you ever needed and they let it go out of print relatively quickly. I think first editions of it go for more than the novel, or pretty darn close. Dang typing. That is “worm” entering Paul’s “nasal” cavity. Equally creepy, though. Yep, I’m another one of those who actually liked, and likes, Lynch’s Dune movie and who never read the books. Like you, Jeff, when I first saw it, I had no trouble following the story (although that may have had something to do with the fact that I was an avid reader of SF and comics at the time), and I’ve seen it 2-3 times since. I don’t even mind the hammy acting – that in fact seems to be a very Lynchian (Lynchean?) trait works for me. And I have to say, Sting did the sneering villain thing so well, it’s probably the best piece of acting I’ve even seen him do. As it happens, the Dune Encyclopedia isn’t considered canon. Herbert supported the project, but didn’t feel bound by it. Which I always thought was a fantastic position to take in the face of modern-day wars over the legitimacy of plaid tribbles and whatnot. I usually weakly support reading the novels through God Emperor, since it’s kind of the conclusion of Paul’s story arc– you get a glimpse of the kind of world he could see himself creating, but denied. For me, it’s a great book and I re-read it about every three years, but I admit it’s a book you major in rather than read. After that, it moves into territory I like but very few other people seem to. Which is why when Tolkein fans talk about the Silmarillion, I kind of know what they’re saying. In my mind, Making an Adaptation of any sort of material comes down to the question “Is this keeping the spirit of the original source material?” if the answer is Yes, then you are making a good Adaptation, if the answer is No, then it’s a Bad Adaptation. But Then again, A “bad” Adaptation does not need to be a bad thing. A good example of that is the Adaptation of “The Mask”, It has Very little to do with the original story. or Disney’s Adaptation of the jungle book has Very little to do with the original story (I cannot confirm or deny this, I never read the books.) And yet I like both quite well. So In my mind, If the Adaptation has so little to do with the original story it can practically be considered a Completely different story. But I prefer a saying a friend told me “You can be a Fan, but Don’t be a Purist”. The original Mask comics were essentially horror comics. The mask itself was more like the One Ring, and it turned you into a cartoonish killer (Chuck Jones powers, but people around you are still made of meat and bone) and effected you even if you took it off. The Stanley Ipkiss character that Jim Carrey played was, in the comics, a regular guy who becomes a revenge killer and even if regular self becomes angrier and more violent. The comic itself can be a bit jarring if you go into it expecting the Carrey movie, because it’s VERY violent, almost nihilistic and pretty mean-spirited. I wonder how a movie would be received if they hewed close to the source material. I imagine they’d freak out, since the Carrey movie is the version they’d remember. I actually took a look at the behind the Scenes on my copy of the movie (I really love that movie) And according to what I learned there, this movie WAS supposed to be a Straight Adaptation of the Comic. But the director decided that it could work Better as a comedy instead. Kinda funny to think about how things would have been different if he Stuck with that. I have been thinking about what creators owe fans when they adapt a beloved property anyway. Are you aware of the fan film Trek guidelines shitstorm? I’m still working through the noise to the facts but apparently the Axanar kickstarter raised enough dough that Paramount finally set guidelines for what you can and can’t do. And the new rules pretty much cripple ALL the new films, including the beloved old timers like New Voyages and Star Trek Continues and Starship Farragut. Fans are pitching a fit and creators are mostly saying good on the studio, though David Gerrold said that the studio left a lot of money on the table by not coopting the fan films and cutting a deal to distribute the good ones. One guy was screaming bloody murder at Peter David that Trek should be public domain now. Meanwhile Chris Pine is telling the press that you can’t do cerebral ST anymore when both New Voyages and STC have been doing it to great acclaim. I’m watching all this and thinking fans are clearly better custodians of the concept but the entitlement in play is pretty disturbing. Anyway. If you guys are still thinking about a fan culture episode there is a lot of new material in the news. I’m really wondering how this will all play out with the fan-film guidelines – it doesn’t look good, though. I was really looking forward to Axanar, and like you said, Phase II/New Voyages and ST Continues have by far been producing the best new Trek material in recent years. But yeah, the entitled fan outrage is often quite disturbing, and I’ve only read a very minuscule sampling. Same with Doctor Who, for the longest time. The BBC was killing it, with cheap budgets and political plays, while the fans were creating great stories and fan films, with no budgets and they got the actors involved. It was successful enough that the BBC borrowed Dalek costumes for the Comic Relief Doctor Who special, with Rowan Atkinson. Steven Moffett did that, which later led to him taking over the revived series.